We are pleased to announce the release of Lost Masters: Rediscovering the Mysticism of the Ancient Greek Philosophers, the latest addition to New World Library’s Eckhart Tolle Editions imprint, which features books personally selected by Eckhart for publication. We hope you’ll enjoy this excerpt from the foreword written by Eckhart and the first chapter, in which author Linda Johnsen explains what inspired her to write the book. It is generally recognized, and taught at universities, that within the European cultural context, the civilization of ancient Greece gave rise to rational thought and ultimately laid the foundation for the development of science. This is all true, of course, but if that were the whole story, there would be no need for this book. It is not the whole story by any means. It is only one half of the whole. There is a dimension, which we could call spiritual, to these ancient philosophers’ work that has been not only largely neglected by academic studies but actively suppressed. It is my view that their ability to think creatively and go beyond the confines of their mental conditioning was because they were able to access, to a greater or lesser degree, this dimension within themselves. As you read this book, you will find that the long-lost masters, who lived in a distant past when the world was young and whose most essential teachings were forgotten or suppressed, are coming back to life within you. As you read this book, you will not only embark on a journey back in time to the very origin of our civilization but you will also find yourself on a journey without distance into the timeless dimension of who you are. No one reads the ancient Greeks anymore. In the last century scholars accomplished something no literate person in past ages could have imagined: they made the Greeks boring. I slept through my Ancient Western Philosophy class in college, resentful that my Jesuit professor inflicted the dialogues of Plato and Aristotle’s outdated metaphysics on defenseless freshmen like me. It would be decades before I realized the Greeks were neither dull nor irrelevant—in fact, until the modern period, Plato was recognized as one of the greatest mystics in the history of Western civilization, and Plotinus (who carried on Plato’s tradition five hundred years later in Rome) towered over the centuries as a giant of Western spirituality. These men were not just thinkers—they were considered sages, transmitters of a profound and inspired wisdom tradition that paralleled the mystical lineages of India. As late as the Renaissance, the stature of the ancient Greek philosophers as spiritual masters of the first magnitude was acknowledged throughout the Christian and Islamic worlds. I didn’t have a lot of patience for the Greeks. Like many children of the 1960s, I turned to the Hindu Upanishads not Plotinus’ Enneads for enlightenment, to India’s Ramayana and Mahabharata not Greece’s Iliad and Odyssey for inspiration, and to Krishna and Buddha rather than Homer or Socrates for heroes. Compared to Hindu seers and Buddhist siddhas, the much-vaunted Greeks seemed like lightweights. Ironically, it was my Indian researches that led me back to Greece. I learned that a Greek magus named Apollonius of Tyana had visited India in the first century C.E. and that a fairly detailed account of his travels had actually survived. Reading Apollonius’ story was a galvanizing experience, revealing astonishing connections between the Greek, Roman, Egyptian, Persian, and Indian cultures, which most modern historians neglect. My interest in the Greek thinkers was piqued: How did it happen that many of their doctrines and religious practices matched the teachings of the Indian sages so closely? Was Apollonius correct when he claimed that the Greeks had learned their doctrines from the Egyptians—and the Egyptians learned them from India? So I returned to the Greeks, reading the portions of Plato my Jesuit professor had advised us students to skip. Sure enough, there was the juice, the living spirituality that so appalls academics today but kept the greatest minds of the Western world enthralled for more than a thousand years. I went back to the original Greek historians, such as Herodotus, Diogenes Laërtes, Diodorus Siculus, and Plutarch, in an effort to learn what the ancients said about their own tradition before modern scholars reinterpreted it for them. I was continually amazed at how similar the long-lost Greek world was to the India I travel through today, where the perspective of the ancients still lives in Bengali villages and Varanasi enclaves and the palm jungles of Kerala. The type of spiritual practices that Plotinus—perhaps the greatest of all the Hellenistic masters—described in his Enneads are as much alive in Himalayan caves today, where Plotinus is unknown, as they are moribund in American and European universities that claim to teach Plotinus! It’s surprising that today yoga students can read Plotinus and instantly recognize the higher states of consciousness he was describing, correlating them point for point with the levels of meditative focus listed in India’s Yoga Sutras in 200 B.C.E. Yet Western scholars often ignore these very passages! They represent “Oriental contamination” of the pure Greek tradition, my professor claimed. And he was right—you can find Eastern influence throughout Greek thought. I was so flabbergasted by the correlations between the Greek and yogic traditions that I started telling everyone I knew about the ancient Western sages. My friends would get as excited as I was and insist, “This information is incredible! It’s unbelievable we haven’t heard about this before. You’ve got to write a book.” So here it is. 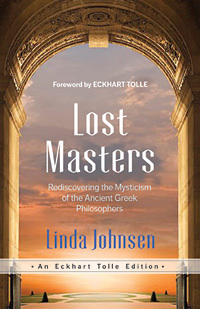 Linda Johnsen is the author of Lost Masters and many other books on spirituality, including Daughters of the Goddess: The Women Saints of India andThe Complete Idiot’s Guide to Hinduism. She has a master’s degree in Eastern studies and has done postgraduate work in the history of religions. Excerpted from the book Lost Masters. Copyright © 2006, 2016 by Linda Johnsen.